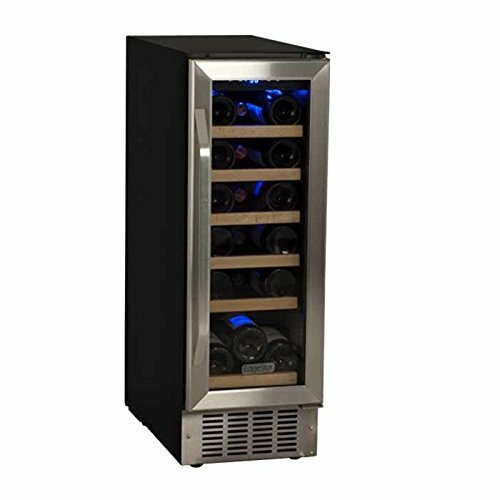 In this Koldfront 18 Bottle Dual Zone Wine Cooler review (black and stainless steel), we explore dual-zone wine storage at its best. Read on to find out how this freestanding unit’s wide set of temperature ranges makes use of thermoelectric cooling technology to make sure all your wine varieties are chilled at their optimal temperatures. 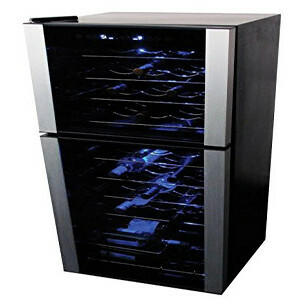 This sleek wine cooler’s main design theme is centered on a stainless steel trimmed black cabinet, instantly making it a great fit for just about any interior. Wooden shelves stylishly extend the cooler’s classic appearance, while the internal light penetrates the tempered glass to present your displayed wines in a very uniquely beautiful way. 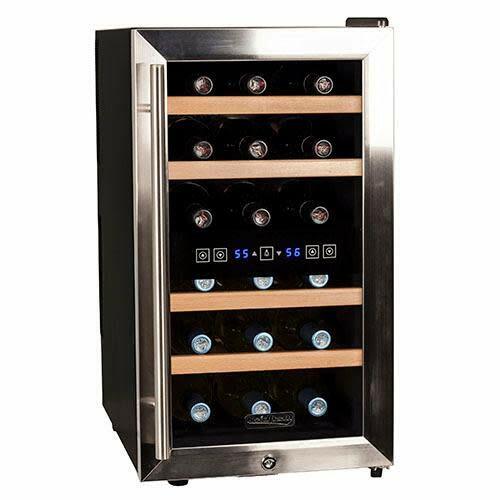 It’s a truly beautiful wine cooler that is consistent with the design standards of the Koldfront 7-Series range of coolers and one could go as far as comparing it to a small piece of a classic California-style wine cellar when installed and switched on. This 18 bottles Koldfront wine cooler weighs in at a “cool” 35.3 lbs and it takes up a volume of 25.33″ (H) x 14″ (W) x 22.25″ (D). It comes with a one-year parts and 90 days labor warranty, which is perhaps sufficient to cover any potential in-transit/shipping damage to the many moving parts of its thermoelectric cooler. The cooler features a safety lock to keep your cargo away from over-eager hands and perhaps makes the best use of dual-zone cooling we’ve ever come across (wide temperature ranges). Designed for free-standing application, the unit’s upper temperature zone has a LED light which can be easily controlled with the control unit. The intuitive control unit obviously then gives you control of the temperature settings as well. 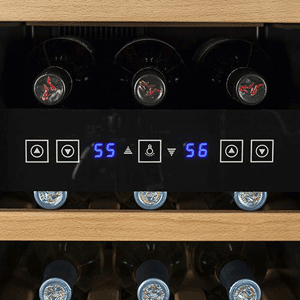 It’s always a good feature of an 18-bottle wine cooler to have two temperature zones. This Koldfront unit has convenient temperature ranges of 54 to 66 degrees (top cooling zone) and 46 to 66 degrees Fahrenheit (bottom zone). This naturally suggests that you’d store your red wines in the top cooling zone and your whites in the bottom zone. Since the temperature range of the top cooling compartment falls squarely within the wider range of the bottom zone, this subtly clever feature means that this cooler doubles up as one which can be used exclusively to store your red wines at their optimal temperature, should you ever be in a situation where you have no whites. Otherwise, both reds and whites can be stored at their optimal storage, chilling or decanting temperatures, but for the fussy wine connoisseur who enjoys wines that are in season, this overlapping and wide temperature range offers some serious value. The LCD control and temperature display unit is conveniently located, featuring very responsive touchpad inputs. The integrated thermoelectric cooling technology used does its job of environmentally-friendly cooling very well, operating the cooler without any noise or vibrations. This cooler maintains the user-set temperatures without any hassles (no significant temperature fluctuations), which is quite surprising for a thermoelectric cooler. This is perhaps an indication that thermoelectric cooling technology is becoming more and more powerful in addition to its efficiency. If your appreciation for alcoholic beverages sometimes goes beyond your favorite wine varieties, you’ll be glad to know that this wine cooler is extremely extensible and can store some of your beer bottles and even cans (they fit perfectly in the lower shelf of the unit). Generally, the overall view of this cooler is also reiterated in our Koldfront 18 Bottle Dual Zone Wine Cooler review. Most owners who have actually used it for some time generally agree that it’s a good little cooler. Its major pulling factor is indeed its compactness in relation to its size, but perhaps also because of the fact that most wine coolers of this size generally don’t have the dual storage/temperature zone feature, which this one does. The beginner wine collector whose collection is just starting to grow will perhaps benefit the most out of this wine cooler. This is also true for any serious wine connoisseurs who wish to store a few of their regularly consumed bottles at the perfect temperature for easy decanting. You can never go wrong with wooden shelves as far as display goes.